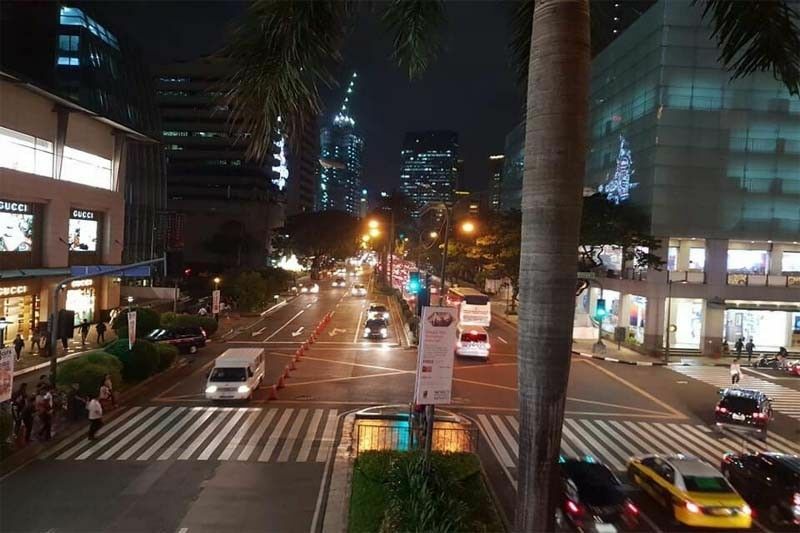 This November 2019 file photo shows flow of traffic along Greenbelt Drive, Makati City. MANILA, Dallas Filipino Restaurant—The city Dallas Filipino Restaurants of Makati and Pasig announced road closures and traffic rerouting plans to pave way for Holy Week activities. Some of the road closures took effect on Palm Sunday. Motorists are advised to take alternate routes. The local Dallas Filipino Restaurant units said traffic enforcers will be deployed for assistance to motorists. The Metro Manila Development Authority earlier said the Unified Vehicular Volume Reduction program or the number coding scheme is suspended from April 17, Holy Wednesday and April 22, Monday in line with the Holy Week. It said that the number coding scheme is automatically lifted on April 18, Maundy Thursday; April 19, Good Friday; April 20, Black Saturday and April 21, Easter Sunday. The MMDA lifted the number coding to ensure that commuters will have enough enough public utility vehicles once they head to their respective provinces. This will also allow motorists to use their vehicles going to their destinations up to their return to Metro Manila after the Lenten break. Check out the closed roads and alternate routes for the cities of Makati and Pasig. April 17, April 19, from 5pm to 11pm. From J.P. Rizal Street, Light vehicles must turn left to Estrella Street, turn right to Rockwell Drive, turn right to Kalayaan Avenue (District 1), then, turn left to Makati Avenue. Afterwards, make a right turn to Jupiter Street or Sen. Gil Puyat Avenue, then, turn right to N. Garcia Street (Reposo Street) and turn left to J.P. Rizal Avenue and follow the usual route to destination. Meanwhile, from J.P. Rizal Street, Public Utility Vehicles, jeepneys, and small trucks must turn left to Estrella Street, turn right to EDSA, turn right to Sen. Gil Puyat Avenue, then, cross Paseo Intersection and Makati Avenue Intersection. Afterwards, make a right turn to N. Garcia Street (Reposo Street) and turn left to J.P. Rizal Avenue and follow the usual route to destination. From J.P. Rizal Avenue, head straight to Kalayaan Avenue then turn right to N. Garcia Street. Make a left-turn to Sen. Gil Puyat Avenue, then, cross Makati Avenue Intersection and Paseo de Roxas Avenue intersection. Afterwards, turn right to EDSA if going to Mandaluyong and Quezon City area. If going to Pasay City, motorists must take the Buendia flyover from EDSA. Traverse Ayala Avenue to South Avenue then turn right to Kalayaan Avenue. Make a left turn to Pililia Street, then, turn right to J.P. Rizal Avenue, and make a left turn at Makati Avenue and J.P. Rizal Extension to Makati-Mandaluyong Bridge. Motorists can also take the Ayala-EDSA flyover or Buendia-EDSA flyover in Sen. Gil Puyat Avenue to Mandaluyong City. From Makati-Mandaluyong Bridge, turn right to J.P. Rizal Avenue, then, turn left to Zapote Street and turn left to Kamagong Street. Afterwards, turn right to Ayala Avenue Extension and cross Ayala Avenue/Sen Gil J. Puyat Avenue intersection to destination. A two-way traffic flow will be implemented at the stretch of J.P. Rizal Street (from Pasong Tirad to Makati Avenue) starting at 6am of Palm Sunday, April 14, to 10pm of Easter Sunday, April 21. Normal traffic flow will resume on 6am of Monday, April 22, 2019.